What inspires you to create? Is it a sketch, a color combo, an inspiration photo or maybe even a product itself? I find inspiration for my projects in various things, sometimes even a song can inspire me to create. 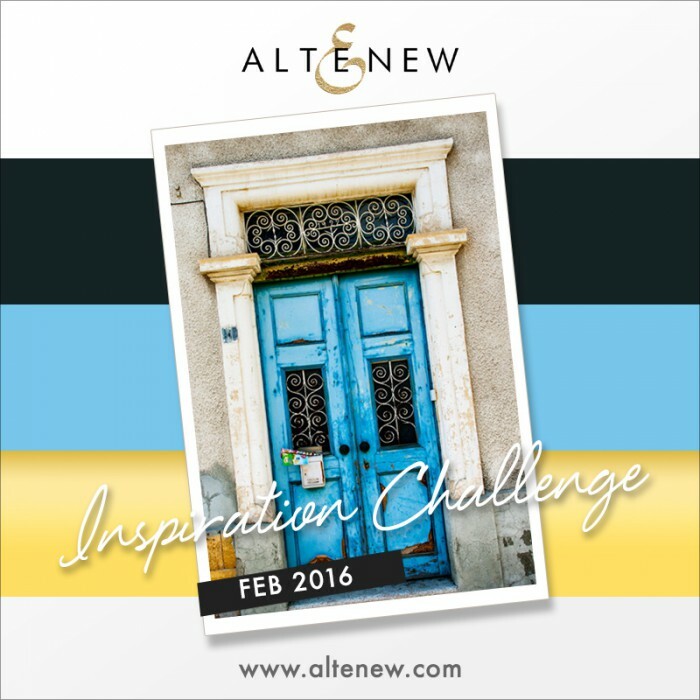 This month I am hosting an Inspiration Challenge on Altenew Blog, we are using one of my travel photos to provide a starting point for our projects. You can see the photo on Altenew blog here. I love using photos for inspiration, I can pick the composition on the photo, the colors, the textures or all of the above to create a card. I was inspired by aqua/gold/black/white color combo and the textures from the inspiration photo. I started by heat embossing flower and leaf outlines from the Beautiful Day stamp set in Brass embossing powder onto Arches cold press watercolor paper (hot press would have been better for this, but I don’t have any so I used cold press instead). The Beautiful Day stamp set is a color layering one, however there are several outlines that can be used for coloring and I’ve been wanting to try to color them for a long time now. I did very basic watercoloring – I wet the paper first using clean water, picked up the pigment with a wet brush and dropped it onto the flower. The paper and water did all the work for me spreading the color around. After the image was dry I also added several highlights to the folds of the petals. I only used aqua and black (watered down to light grey). The Beautiful Day stamp set doesn’t have matching dies so I had to fussy cut the images out, I cut them right up against the line and didn’t leave any border. I love using Altenew vintage trims and I incorporated one of the gold trims into this project – layered the flowers and leaves over and behind. 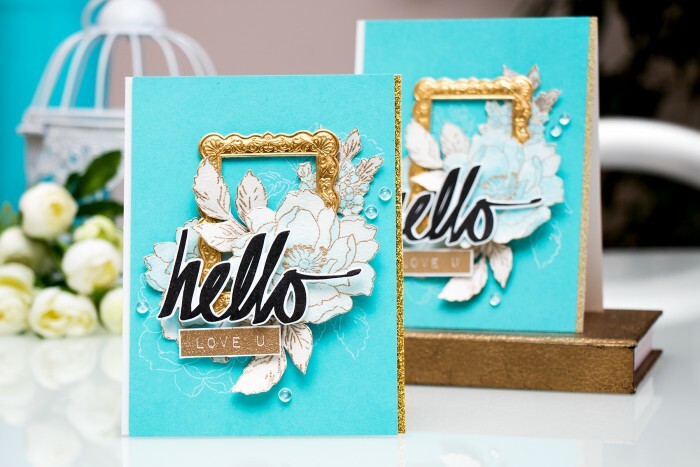 For my sentiment I went with Super Script and stamped a simple Hello in black and also heat embossed Love You using the same brass embossing powder to add some additional texture. 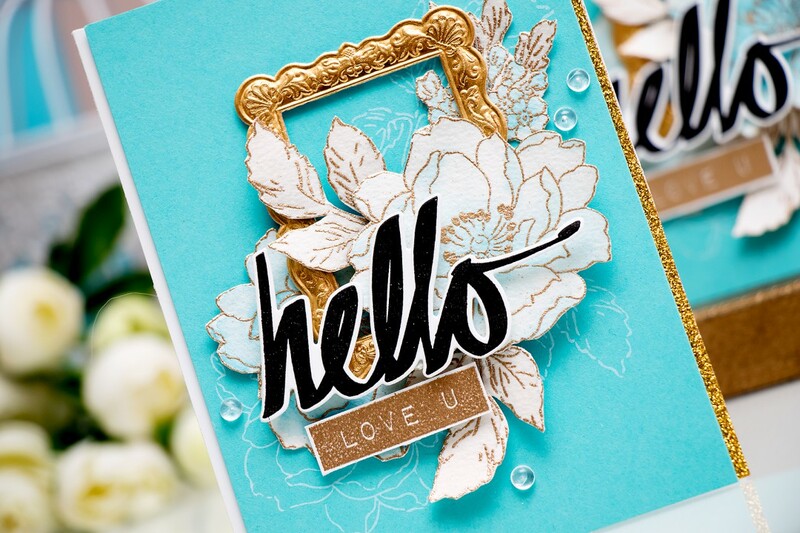 The entire cluster was adhered onto a panel of aqua cardstock, I did pre-stamp it using the same floral images and white ink to create additional interest. Finally I added a strip of gold glitter tape/paper and embellished the card with a couple clear droplets. 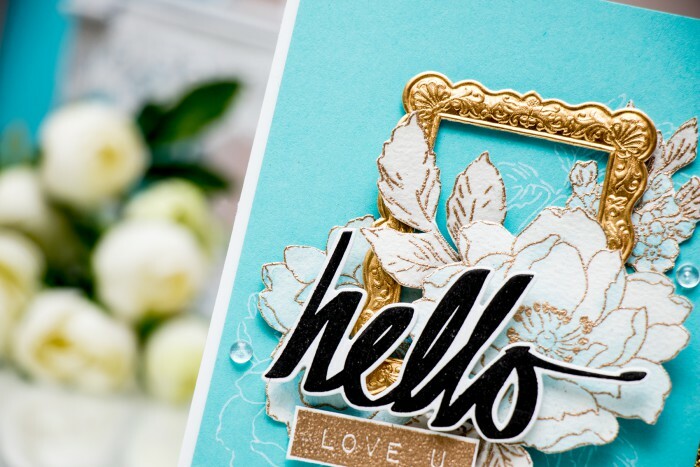 I’m sharing a video tutorial today showing how easy it is to make this card! You can watch it at the top of this post or on my Youtube channel. If you like it, I would appreciate you giving it a thumbs up and sharing. Thank you! Yana, I absolutely love this card and others, have been popping in here every so often. Love where & how you put the dimensions on this particular card. IT’S ABSOLUTELY BEAUTIFUL. Oh, I love your new profile picture! Incredibly beautiful card!! Love this color combo, so gorgeous! I’m often inspired by colors. I’d say – mostly. Well Yana, I think this time you may have out-done YOURSELF! This will be hard to top, don’t ya think???? LOL Oh my goodness, this is positively STUNNING! OK, so I HAD to pin this to try and I can only hope it turns out half as good, if so I will be thrilled! Thanks so much for sharing this. LOVE IT! Yana, I love your work. This card is stunning as always. I love the color combo, you always put such great colors together. Thanks for sharing, inspiring and your videos.